Colourful Balinese boats take Lovina tourists out to see the sociable dolphins, most active at sunrise, and the reef-protected waters provide a calm environment for snorkelling. Situated between the main diving sites on the north coast of Bali, Lovina is a good base for diving excursions. The black-sand beaches are calm and good for swimming. The town of Lovina on the north coast of Bali is actually a collection of 6 coastal villages which almost merge into one another. Kalibukbuk is the biggest and most popular of the villages. Despite the Lovina area being the second largest resort on the island of Bali, it is much less developed and laid back than the crowded resort of Kuta in the south. There are no direct flights to Lovina, Indonesia itself however there is a great choice of flights available into Bali on airlines including Singapore Airlines, Malaysia Airlines and Cathay Pacific. 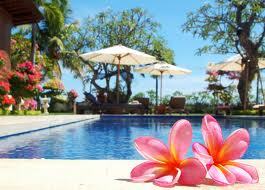 For low cost flights to Lovina, Indonesia, try searching for Air Asia X flights into Bali. Bordering beautiful rural countryside, the guesthouses and hotels of Lovina can be found along the coast or dotted amongst the stunning greenery of the nearby rice fields. Unlike the golden sands of the south of Bali, the northern beaches are made up of volcanic black sand and the calm tranquil seas are protected by reefs close to the shore. The clear water and coral reefs are perfect for snorkelling and scuba diving, however one of Lovina’s main attractions are its dolphins with many boat trips leaving at sunrise to spot these beautiful creatures. For some traditional culture, head to the Buddhist monastery of Brahma Vihara Arama and the sacred hot springs of Air Panas in Banjar with its stunning jungle setting and healing waters. To save money and get the best deals on the cheapest flights to Lovina (Bali), we advise you to book in advance if at all possible or look out for the various special deals which airlines release throughout the year. For great offers on cheap flights to Lovina, Indonesia, try our flight comparison search which will compare prices from a whole host of our travel and airline partners. 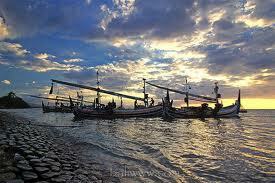 If you need lastminute flights to Lovina, Indonesia, we can also find you the cheapest fares. Lying just south of the equator, Bali has a tropical monsoon climate with two distinct seasons: wet (November to March) and dry (April to October). The dry season has hotter temperatures, but the humidity levels are much higher during the rainy season. The height of the summer season also brings cool breezes to temper the hot weather. The average annual temperature is about 86F (30C).